We now turn our attention to Sonny Milano. The forward enters his fourth season with the Blue Jackets organization after the team chose him 16th overall in the 2014 draft. A first look at his career to date paints a bleak picture in terms of his NHL career. Milano has just eight NHL games under his belt. This includes one playoff game when he replaced Matt Calvert for Game 3 of the Penguins’ series last season. The NHL suspended Calvert one game for his actions in Game 2. Milano has yet to score an NHL goal. He did tally his first NHL point in 2015-16. Looking back at the first round of the 2014 draft, the early results aren’t promising. Four players have yet to play an NHL game from that draft. Those are Michael Dal Colle, Haydn Fleury, Travis Sanheim and Conner Bleackley. Everyone else, including Milano, has seen some NHL time. But of the 26 remaining players, only Milano and Alex Tuch have yet to score an NHL goal. Both Robby Fabbri and David Pastrnak went later in that draft than Milano. Imagine if the Blue Jackets had one of those players. With these early results, it’s fair to wonder what the immediate future holds for Milano. He like the rest of the Blue Jackets’ prospects will attend training camp in the hopes of making the team. Is Milano ready for a full-time role? If he makes the team, can he stick around for the entire season? What could his playing time look like? We’ll try to come up with some answers for you. Milano is an interesting case. Remember when trade reports surfaced at the 2016 NHL Draft? Many thought the Milano era was over before it started. It turned out that those were premature reports. There was no trade. Milano was still a Blue Jacket. Even today, most “trade rumors” you see involving the Blue Jackets somehow involve Milano. It’s like fans have given up on him before his career unfolds. Here’s my question. Why? Why is everyone giving up on him so quickly? A deeper look at things suggest that not only is it too early to give up on him, it would be foolish to. From both an eye-test perspective and a numbers perspective, Milano offers next-level upside that the Blue Jackets need in future seasons. What am I talking about? Let’s start by looking at the eye test. The thing you look for when utilizing the eye test is improvement over a certain length of time. How is his game now as compared to earlier seasons? In my viewings of him, there is a vast improvement. We all know the offensive upside Milano brings. He can score highlight-reel goals. Need an example of this? Check out this insane, backhanded goal he scored in the AHL Playoffs. Offensive upside has never been questioned with Milano. It’s his defensive play that has generated questions. Can he play an effective two-way game at the next level? The Blue Jackets made it a point of emphasis for Milano to improve defensively. He spent most of the 2016-17 season focused on improving his two-way game. He spent more time in the defensive zone both on the puck and away from the puck to clean up his own end. He excelled at this as the season went on. 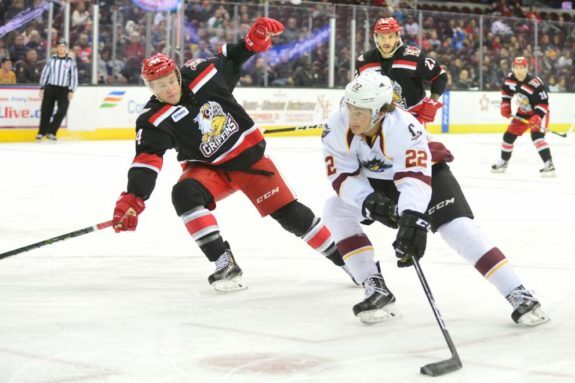 Monsters’ Coach John Madden responded by giving Milano more responsibilities, including a role on the top penalty-killing unit. When Madden was asked about this, he said “I wouldn’t put him (Milano) out there if I didn’t trust him.” In every big situation, Milano was on the ice. At the end of games when the Monsters held one-goal leads, Milano helped keep those leads. He’s making better, more responsible decisions with the puck. He’s a more confident player. And as we’ll see later, he still produced good offensive numbers. When Blue Jackets’ Management says draft and develop, this is what they’re talking about. Milano still has the speed and offense. He now will come to camp equipped with a more complete game. From an eye-test perspective, do not sleep on him. He’s ready to prove to everyone that he wants to stay with the big club. His spot is there for the taking this season and next, especially if Calvert decides to test free agency. Now what about Milano from a number’s standpoint? 2014-15: 0-5-5 in 10 games for Springfield. 2015-16: 14-17-31 in 54 games and 4-4-8 in 17 playoff games for Lake Erie. 2016-17: 18-29-47 in 63 games for Cleveland. Milano improved from .57 points/game to .75 points/game. That’s nice to see. To take it even further, Milano’s 2016-17 season looks even better in comparison to players of his age. The following stats are all courtesy of prospect-stats.com. We looked at players under age 21 who played at least 50 AHL games. There were 40 players who met this criteria. Here is where Milano ranked. These numbers account for all situations. Primary Assists: 17 (T-3rd) *only John Quenneville and Jack Roslovic were higher. Primary Points/Game: 0.56 (4th) *only Kyle Connor, Christian Fischer and John Quenneville were higher. For someone who has yet to turn 21, these are encouraging numbers to see. At 5-on-5, Milano’s expected primary points per 60 came in at 1.50. That ranked 7th out of those 40 skaters. Of Milano’s 28 points at 5-on-5, 23 of those were primary points. This points to him driving the play and creating opportunities. Milano was most of the Monsters’ offense last season. His 47 points was six more than T.J. Tynan. As one of the youngest players on the Monsters, this is another encouraging sign. In terms of Milano’s development, I’ve seen nothing but good things both in viewings and in his numbers. It’s for this reason that one of my bold predictions for this season is that not only will Milano make the Blue Jackets, he’ll finish the season in their top-six. You heard me. If we’re looking five years from now for upside, I’d rather have Milano over Calvert, Boone Jenner and others who could play left-wing. Assuming he’s not traded, Milano should be a fixture in this lineup in the coming years. Artemi Panarin appears to have the top left-wing spot locked down. You’d think either Jenner or Nick Foligno opens on the second line as a left-wing. It’s not out of the question that Milano works his way up the depth chart into this spot. It’s not likely but it’s not impossible. If you haven’t paid close enough attention, Milano is going to surprise you. Many fans seem to think he ends up in Cleveland to at least start the season. He’s one good training camp away from starting in Columbus. I’ll be watching Milano closely at camp. I believe that he and Oliver Bjorkstrand are the two Blue Jackets most primed to enjoy breakouts in 2017-18. Can Milano make the most of training camp and crack this roster? Given the state of the bottom-six, I like his chances a lot.